116 p., 15,5 x 23,0 cm. With contributions by Ivan Boldyrev, Detlef von Daniels, Andree Hahmann, Lars Leeten, Leander Scholz, Norman Sieroka and Thorsten Streubel. This paper contrasts Jonathan Bennett’s field metaphysical interpretation of Spinoza with field theoretic approaches from modern physics. Given the broad variety of examples provided by Bennett and his followers, this discussion encompasses both classical as well as quantum field theories; in particular, different versions of geometrodynamics and the attempts by Einstein and others towards a unified field theory. This then leads to the question of whether a sustainable analogy between modern field physics and Spinoza’s metaphysics (and hence a Spinozian philosophy of nature) is possible at all. Such an analogy seems available, but — as the discussion will show — it is strongly dependent on the interpretation of Spinoza’s distinction between finite and infinite modes. Andree Hahmann: Kant und die Dinge an sich – Was leistet die ontologische Version der Zwei-Aspekte-Theorie? The problem of the thing-in-itself surely belongs to the oldest and most fiercely discussed questions among Kant scholars. In the last years, one interpretation has become widely accepted according to which the Kantian expression of thingin- itself must be understood as a short version of thing in itself considered. Thus, Kant only introduced an epistemological distinction that says nothing more than that the same things are considered with neglect of the transcendental forms of intuition: space and time. However, important exegetical and systematic reasons contradict this interpretation. Therefore, this paper argues for a revised form of this approach, which, on the one hand, claims to furnish a consistent interpretation of all Kantian statements and on the other hand, is supported by crucial systematic reasons. 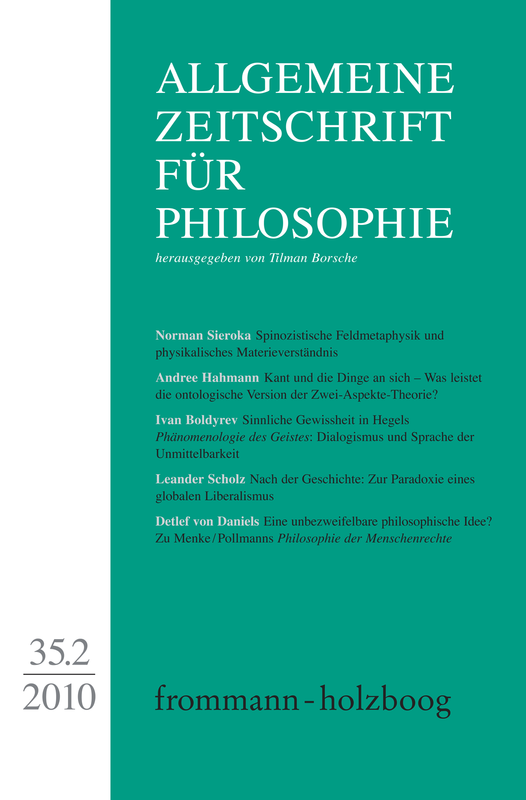 The paper shows that, in the »Sense-Certainty«-chapter of his Phenomenology of Spirit, Hegel uses a particular form of narrative, presenting the Philosopher in a dialogue with Sense-Certainty. Hegel has thus achieved to build a character (Gestalt). Thus, he could persuade his readers that Sense-Certainty itself gives birth to a truth that eventually leads us beyond the certainties of mere sense experience. Readers are shown that right before their eyes a seemingly coherent philosophical position dismantles and supersedes itself. This movement has the literary credibility of a philosophical narrative. The performativity here is seen in the fact that Hegel takes advantage of the philosophical opportunities of language. Moreover, the very acts of reading/ speaking, that is to say, various forms of discursive experience are crucial factors for the dialectical movement; the story justifies itself due to the mere fact of its existence and unfolding. This article argues that Francis Fukuyama, in opposition to the modern adaptations of Hegel’s philosophy of history by Joachim Ritter and Jürgen Habermas, maintains a postmodern position in reaction to the globalization of liberalism. The paradox of this position is that the modern project of universalization has to give up its claims to justice, but must simultaneously be continued for reasons of stability. The philosophical background that leads Fukuyama to this conclusion is initially explained on the basis of the contradictions of Kojève’s interpretation of Hegel. In doing so, this article understands the philosophy of history not only as a hermeneutical field of collective sense-making but always as a theoretical field of concrete instructions for political practice. Ever since the end of the cold war, human rights have become the dominant idea in the discourse of international politics and political theory alike. This article argues that philosophy need not be confined to merely justifying this preoccupation but can instead develop a more nuanced, sceptical view. I demonstrate that justifying human rights on the basis of the experience of the Holocaust does not bear up under critical scrutiny and that founding human rights on a theory of recognition is too unspecific. At the same time, a fixation on human rights may ultimately have the effect of underestimating the importance of the political dimension in both constitutional theory and the international arena.